Alabama, Clemson, Penn State, Washington, Western Michigan, and Oklahoma capped off their impressive seasons with conference championships this weekend. This presents the most challenging scenario for the College Football Playoff committee. Alabama and Clemson seem to have the strongest cases for the playoff, but Ohio State, Penn State, and Washington each have a very strong case for the final two spots. Michigan, Western Michigan, and Oklahoma also had great seasons that many could use as justification for an 8-team playoff. 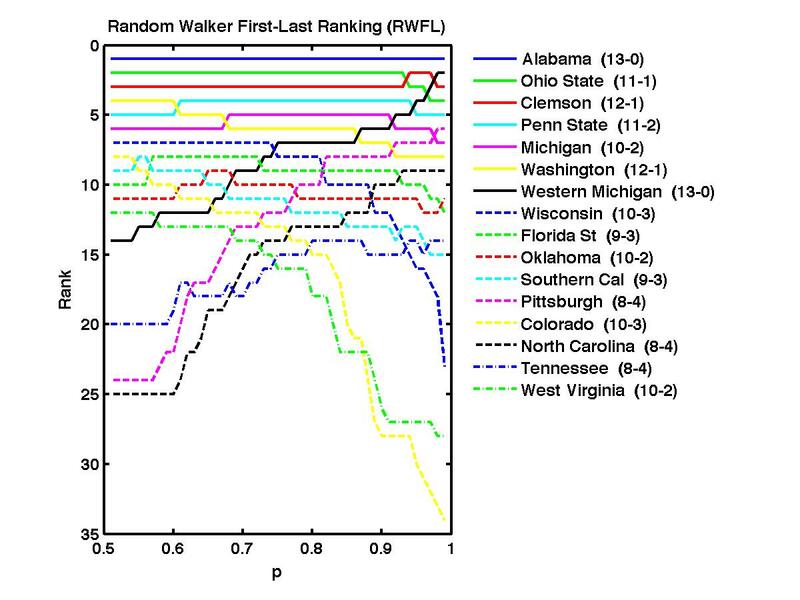 The random walkers, who don't care about explicitly about conference championships or preseason favorites or school reputation, have Alabama, Ohio State, Clemson, and Penn State as the top 4 teams for almost all parameter values. The only exceptions are that at low "p" values (where strength of schedule is most important), Washington moves into number 4 and Penn State falls to 5, and at high "p" values (where win-loss record is most important) undefeated Western Michigan moves into the top 4 while again Penn State falls out. 1) "Eye test" wins out: Ohio State and Washington get in. 2) Conference championships and head-to-head win out: Penn State and Washington get in. 3) "Eye test" and stronger weighting towards late season results win out: Ohio State and Penn State (9 game win streak after starting 2-2) get in. This is how the random walkers would vote.